How Much Are Peoples Homes Worth? - Looking At Some Demographics. 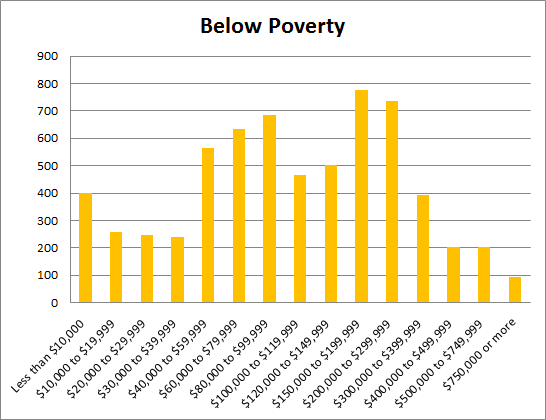 I previously looked at the values of homes in How Much Are Peoples Homes Worth? 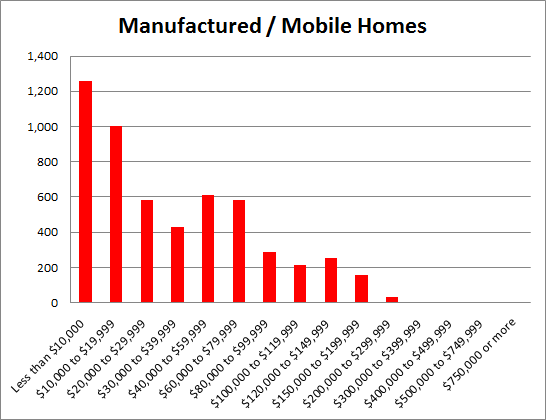 The American Housing Survey that I got that data from also breaks down home values into some specific demographics. 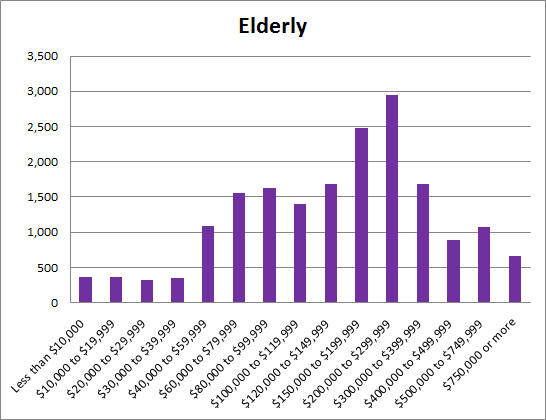 Lets look at how home values break down for those demographic groups. 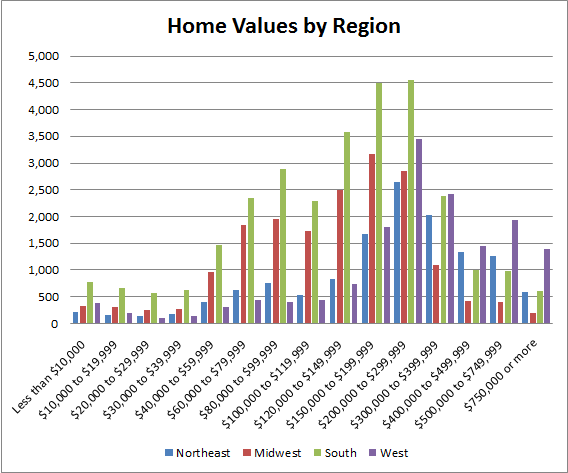 Homes are generally lower value in the South. The highest value homes are normally found in the West. The Midwest and Northeast are more often in the middle. Not too surprising there. 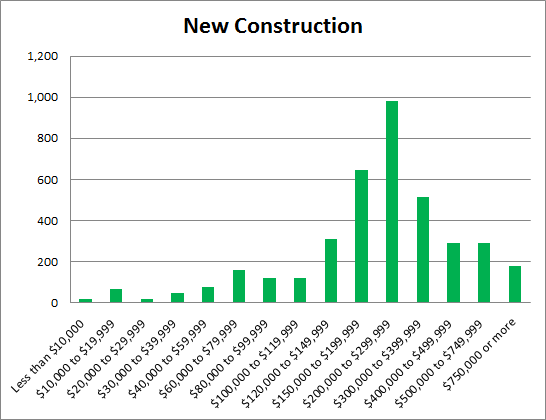 The values skew higher and theres very few new construction homes worth less than $80k. I'm a bit surprised that there are homes in the >$200k level. And while you can't see it on the chart theres 1-2 homes in the highest price ranges as well. Thats kind of odd. However I"m guessing these very high value homes are manufactured structures in the sense that they were primarily built off site then transported to the lot. Or maybe someone parked a trailer on 5th avenue in Manhattan? There isn't much difference between the values of homes and the general population. Here we see something interesting. Theres more homes in the low value levels but there are still plenty of homes in the medium and high end. Of course income and assets are not really equivalent. You could feasibly have someone living in a $1M house in California that they bought in 1960 and only living off a $1000 social security check. Also you can have relatively wealthy people showing low income in a given year simply because they didn't have earnings, but maybe they're just living off the giant pile of cash in their bank account. Of course theres also some people committing fraud of various sorts. A bet one or two of those people in >$750k homes are committing tax evasion and fraudulently reporting a very low income.